Woohooo! We are so excited to be performing this show in 2019 and to be part of Camden People's Theatre Spring Programme. I am so happy to announce that I have been commissioned by Upstart Theatre to create The Promised Land. 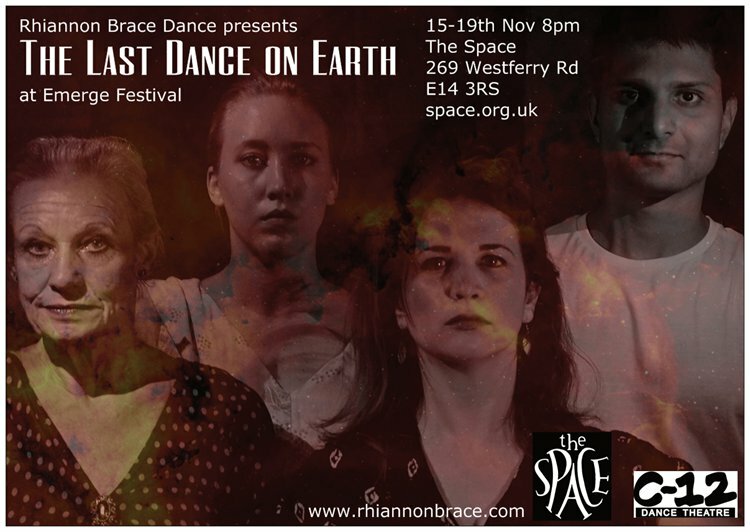 The piece will be performed on two nights during Dare Festival at Shoreditch Town Hall 25- 27 October. The piece will also feature Scott Swinton who was part of Mr President and has just returned from Edinburgh from his one man show Karaoke Saved My Life. Dissidents formed to perform at Sadler's Wells' Elixir Festival in 2017 and they are still going strong with a fantastic recent performance at Queen Elizabeth Hall for (B)old Festival. They now launch their short promotional film and look forward to lots of future performance. See bold performance work from artists challenging society’s perceptions of age. Come along for an afternoon featuring pieces by artists and communities who are challenging people’s perceptions of what work created and performed by older artists can be. (B)old Communities is a celebration of people who are challenging society's perception of age through arts and creativity. Experience performances from across art forms and hear from those making the work about what drives their creativity and how their projects are impacting people's day-to-day lives and the wider community. More good news! Our newly titled Mr President will be performed for the second time allowing us to try out some new ideas in front of an audience before we work on a longer length show. You can catch us at Freshly Scratched at Battersea Arts Centre on Wednesday 2nd May at 8pm. The scratch event has a pay what you can booking system. We are so excited that Dissidents have been selected to perform at Ignition Dance Festival Community showcase at Rose Theatre, Kingston on 16 June at 5pm. The Dissidents will be performing Voodoo Child which Rhiannon choreographed for Elixir Festival at Sadler's Wells last June. We are all incredibly excited that they get another chance to rock out to Jimi Hendrix and also we get chance to make some improvements to the piece. Did you see us on London Live News being interviewed about the new show Inauguration? It was a lovely experience and a great way to get involved in a discussion about the show and Trump in the context of it being the week of International Women's Day. We are so excited to be working on a new show Inauguration inspired by the stable genius that is Donald Trump. The show offers an alternative Inauguration ceremony reflective of the values of the 45th president. Rhiannon Brace is supported by Studio Wayne McGregor through the FreeSpace programme. 5 star review to us at Camden Fringe!!! You can read the review of our show at Camden Fringe here. 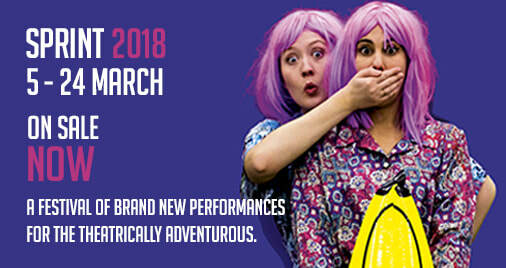 Fringe Festival Tickets on sale! Book now for 3 dates. So excited to be presenting Dissidents at Sadler's Wells Elixir Festival on Saturday 24 June. We will be in Programme A Elixir Extracts. We had such a great time performing Baby at the Lilian Baylis last year and we are going back with something very new. Booking and about Elixir here. Rhiannon's Physical Theatre class at Move It has now sold out! Catch us next at our Sunday classes at Marylebone see here for more details. 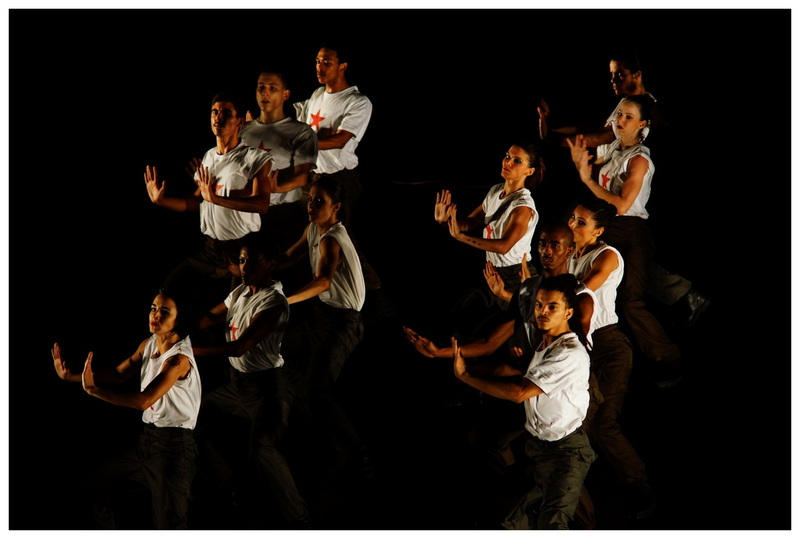 My fascination with Cuban dance continues as Danza Contemporánea De Cuba arrive in London on their UK tour. 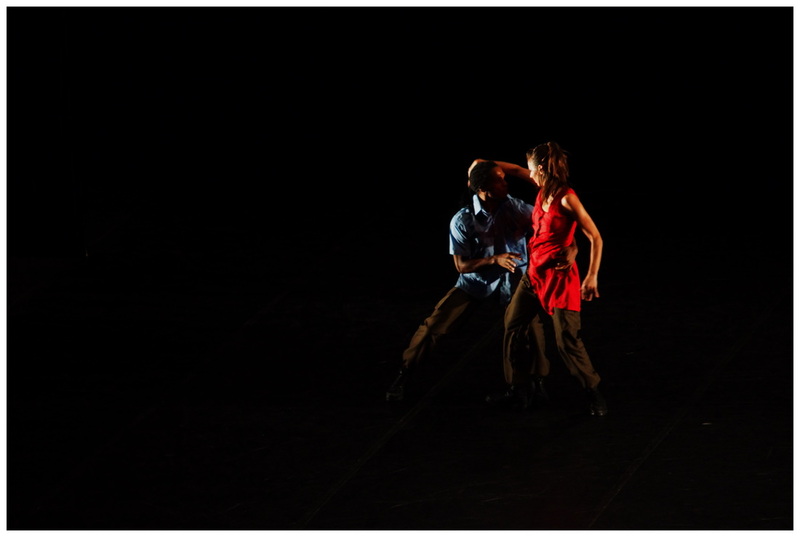 Read my interview with Theo Clinkard about creating The Listening Room for Danza Contemporánea De Cuba. You can read the interview here. You can read my article about the company written after my trip in 2015 here and my review of their 2017 London performance is available here. Come and check out my Physical Theatre class at MOVE IT 2017. I will be teaching at 1.45pm to 2.30pm on Sunday 12 March. Tickets are going fast as this is an open level class for all ages and levels of ability. You can book here for the class and you will also need an entry ticket to the event itself. We anticipate starting a new Summer term of workshops from May to July. More details and booking is here. The Last Dance on Earth - five night run! Inspired by the Orson Welles 1938 radio broadcast of War of the Worlds, a family spend together their last hours on earth. The fear of the unknown lies outside the safety of their room where they dance, perhaps for the last time. 15th to 19th November 2016 at 8pm The Space E14. Come and take part in our classes held by Rhiannon at Marylebone Dance Studio. We are holding five over the Autumn period. You can attend the course or just take one or two as a drop in. We particularly welcome all ages and levels of dance or performance to attend. 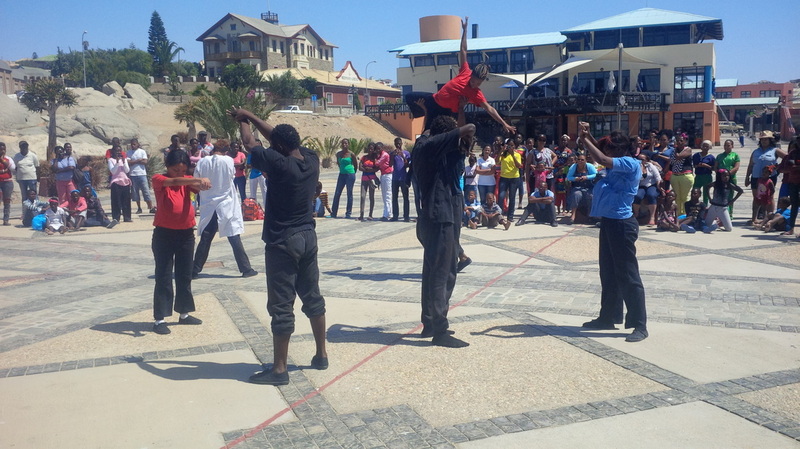 No dance experience required as we work in a slightly differently way. 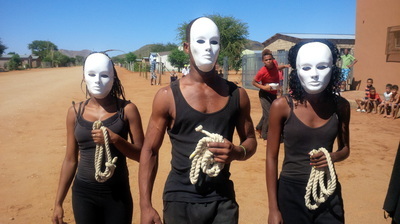 The aim of each workshop is to create something new as well as explored performance technique and ways of creating choreography. Facebook event for next workshop on Sunday 16 October is here. You can book for a future workshop through Eventbrite here. Booking opened for Hop Fest Fringe! Baby has been booked to perform at Hop Fringe Festival in Faversham on Saturday 3 September! This will be the show's first taste of Fringe which we hope we can build upon next year! We will be part of a double bill with The Little Girl Who Was Sold With the Pears for children aged 3 to 7. The whole event will be open to families with babies to attend. You can book tickets here. 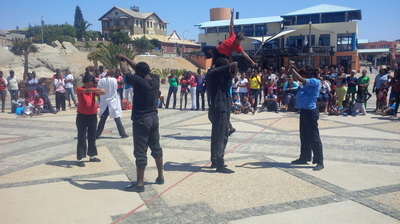 Outdoor performance. More details here. Sadler's Wells presents dance in a wide range of styles from groups and companies in North London who have been inspired by Big Dance. Bring your friends and family and be inspired by dancers in a mixed bill performance from a range of local artists and performers. 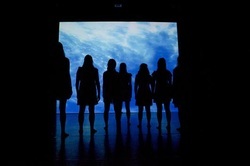 Dandelion Collective: "When we see we are one"
Tickets are free but you need to book. We really enjoyed performing on the second night at Footprint Dance Festival at Roehampton University. During the day Rhiannon and the dancers held an inter-generational workshop with some dance students and some elderly people from Regenerate Rise. The workshop consisted of talking about the show and displaying segments from it and then doing a seated movement session with the group. The babies yet again behaved beautifully and baby Jessica who is now 19 months clapped her hands as her mum danced and said "bye" to the audience as the performers left the stage. We got Arts Council Funding for the second stage of development of Baby and to support rehearsals for our performance at Footprint Dance Festival on Tuesday 10 May 6pm. We are all so excited! Rehearsals are now underway and we have made a few changes, added some details and a tiny bit of extra choreography. We are super excited to be performing a short snippet from Baby at the Southbank Centre this coming Tuesday as part of Pineapple Community's Community Dance Programme. We created some of the show through the support of the Southbank Centre so we are so excited to be returning there on Tuesday to perform on the Clore Ballroom. It will also be fun to take part in the workshops happening there from 2pm as well as seeing the other dance groups performing in the showcase. 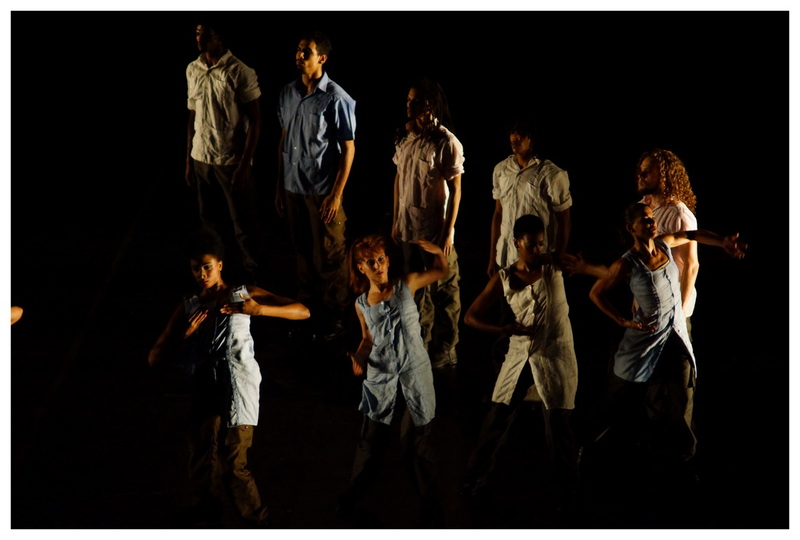 We are pleased to say that Baby will be performed at Footprint Dance Festival in May at Roehampton University. More details will follow soon. Many thanks to our photographer for beautifully capturing our show during the tech rehearsal at The Place. You can find her work here. Baby was performed at Resolution 2016 on Wednesday 20 January. The whole team was very happy with the show and the wonderful reviews and the babies stole the show as expected! The audience became very vocal when the babies appeared on stage and we got a lovely cheer of applause at the end. The plan is now to apply for funding in order to continue working on the show and finish it. September 2015: Baby - a new show. Rhiannon is currently working on a new show due to be finished early in 2016 and performed throughout 2016. Watch this space! This show will be different in style to earlier performances as it will draw on personal material from Rhiannon's pregnancy and childbirth. July 2015: Rhiannon is currently working on a commission for a flashmob and about to embrace motherhood for the first time. Check out Rhiannon's blog of a visit to wonderful Cuba in May 2015 especially some days spent with Danza Contemporanea de Cuba with photos by Monster Cat Pics. You can read Rhiannon's article on Londondance.com here. Rhiannon joined other artists in presenting a 3 minute performance for Club Hashtag at Bethnal Green Working Men's Club in December 2014. The performance was called Nativity and consisted of a dance of five Nativity angels. Rhiannon plans to develop Nativity over many years; each year adding another section/dance. You can view the film of the performance here. Watch this space in future years for further Nativity action! In August 2014 Rhiannon will be flying to Wyndhoek in Namibia to work with the OYO Dance Troupe – Namibia’s first professional dance company. 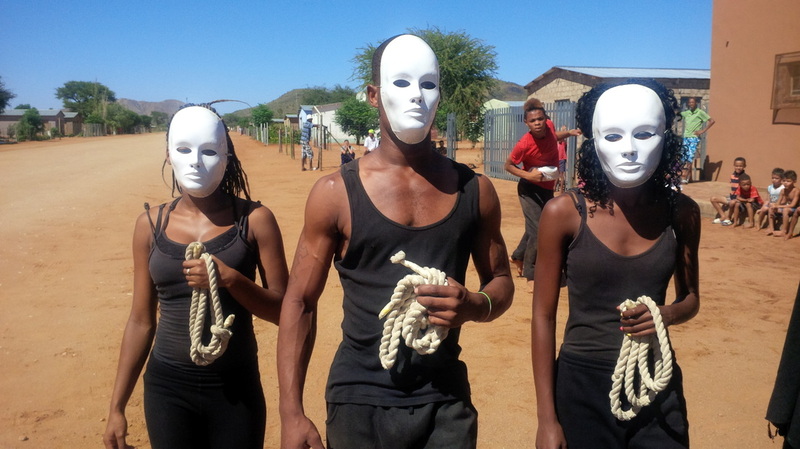 Rhiannon will spend a month with the company alongside several other invited international artists in order to make a new show based on a specific social issue affecting the Namibian youth. 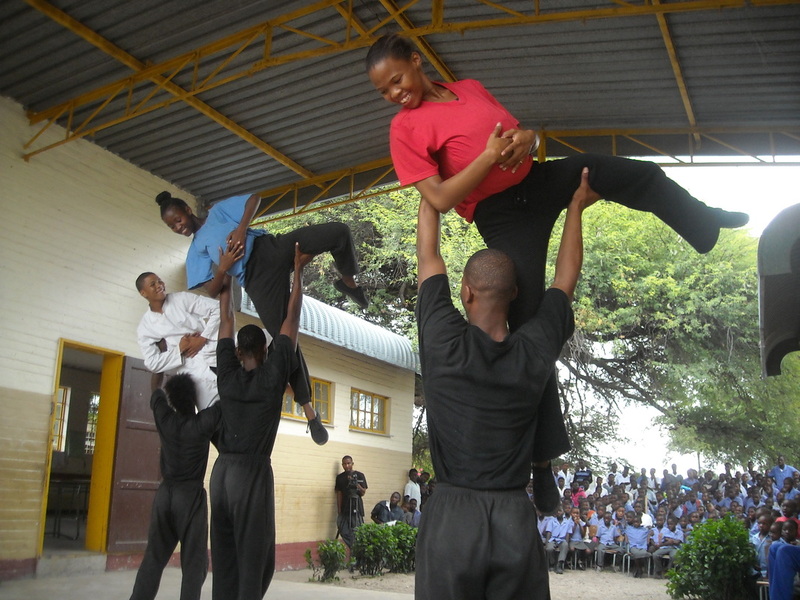 The OYO Dance Troupe create social awareness in young people utilizing contemporary dance, in particular physical theatre. OYO’s vision is to develop a society in which there is broad access to information and the arts. By developing their creative skills, young people enable themselves to make better choices, and thus to become more prosperous, to increase their life expectancy, and to improve the quality of their lives. You can find out more about this project here. The Legacy performance at Resolution is mentioned as part of Judith Mackrell's blog in the Guardian. You can read the article here. The Legacy was performed at Resolution! 2014 The Place, Robin Howard Dance Theatre to a sell out audience. 15,000 volunteers. 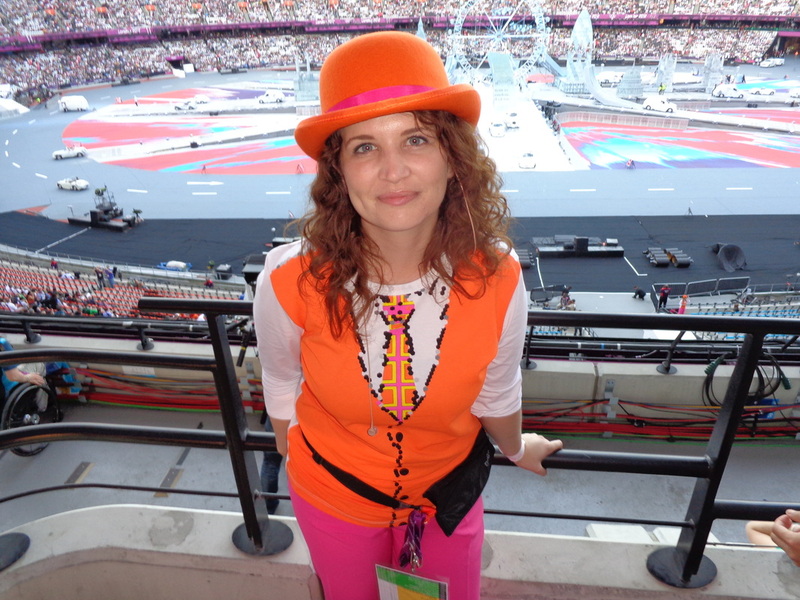 4 Olympic/Paralympic ceremonies. Housewives, teachers, bankers, became drummers, dancers, nurses, and workers of the Industrial Revolution. 40 ceremonies performers explore how they live on, now 2012 is over. London New Year's Day Parade. Together with some dancers from The Legacy cast, Rhiannon braved the pouring rain to accompany the Pandemonium drummers in dancing to their hippy rhythms. The Legacy dancers used Rhiannon's choreography as they danced through the streets of London culminating in a final performance to a seated audience. 2012 was all about the Olympics!!! Rhiannon stopped working on The Ophelia Project and turned her attention to rehearsing and performing in the Olympic and Paralympic ceremonies. This experience proved valuable, if not, life changing in terms of the lasting legacy of the Olympics; the friendships made, the subsequent events and the ideas that have now gone into working on a new piece of theatre. 25 YEARS International Festival Gathering - Cardiff. Rhiannon was awarded a bursary by The Magdalena Project to attend, take part in workshops, watch performances and help out with the festival where she can. 27 - 30 July 2011 - Rhiannon is appearing in Carlos Acosta Premieres 2 at the London Coliseum. Having appeared last year in Premieres, Rhiannon will again return to the Coliseum to be part of the chorus of Premieres 2. Please see last year's blog entry. The Ophelia Project organised a performance involving women from the local community at The Shimmy event at Wandsworth Park on 22 May 2011 as park of Wandsworth Arts Festival. Rhiannon held three workshops with Wandsworth WI, Women of Wandsworth (Mums) group and an open workshop at The Royal Academy of Dance to teach participants technique and the movement required for the flashmob. 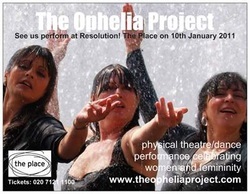 The Ophelia Project were joined by women from the local community to form a travelling performance. Watch and join in in this unique expression of solidarity and sisterhood. The Ophelia Project, is concerned with celebrating women and empowering women by creating opportunities and performances. For more information please see the Ophelia Flashmob website and photos taken by Candid Creativity. There is also a very short film here. She Walks in Beauty is selected for Resolution! 2011 at The Place. 20th March: Newington Dance Space - Work in Progress sharing. 21st March: Brockley Jack Theatre – Scratch night. 24th April: Physical at The Space, Isle of Dogs. Organised by Theatre of Inspirations. 7th May: Variety Box at The Others, Stoke Newington. 18th May: 6.30pm Student’s Union at Institute of Education as part of Latin American Cultural Week. 29th May: Marquee Performance at Grand Re-opening of Hatcham Gardens, London. 24th July: Riches Uncovered Festival.